In the below video, Dusty (played by Kirsten Holly Smith) & her girlfriend Claire (Christina Sajous) serenade & seduce each other with “Baby It’s Cold Outside,” subverting the practically date-rapish undertones of the original. 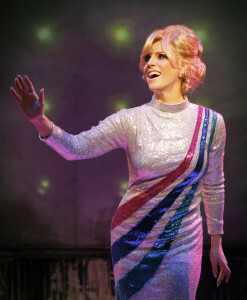 What’s so special about Dusty Springfield that you decided to devote years to “being” her on stage? Also, Dusty took total control of her own image and look. She never preached to young girld, but set an example that they could be anyone they wanted to be. If shy, chubby and awkward Mary O’Brien could become Dusty Springfield, glamorous Queen of the Mods, then any young girl could do anything. Dusty became the first female pop star it was cool for teenage girls to like. Before Dusty, girls were only supposed to be fans of pretty-boy singers. Dusty was a pioneer in the battle for racial equality with her stance against apartheid by not singing for a segregated audience in South Africa (and getting booted out of the country for it) and by bringing the original Motown artists to England and performing with them on national TV on the same stage. And then in 1970, she came out as gay in a newspaper interview. It seems like Dusty as a person exemplifies profound strength and weakness, what was it like balancing the two. We (meaning my c0-writer Jonathan Vankin and myself) were always aware that it was a dangerous task – go too far into the dark side of her life and you risk losing empathy for her. Don’t go far enough and you risk whitewashing. Our director, Randy Myler, was constantly cautioning us against turning her into “Saint Dusty.” But with all of her struggles, and personal demons, she was always a warm, kind and very funny person… sometimes downright silly. any time we felt we were getting too dark, we came back to her humor. She always has a quip or a smart remark even in the bleakest situations. Google her quotes page. It’s pretty fabulous. What was the hardest part of portraying Dusty. She is such a big character with a rabid group of fans. People who are big Dusty fans or knew her personally can be very possessive of her. I can only interpret the character from my own artistic perspective. There will never be another Dusty but I can do my best to honor her story and keep her legacy and memory alive. The most fun I have is when people who actually knew Dusty, like Paul Huntley (our wig designer) who did her wigs in the 60s, come back to your dressing room with tears in their eyes and say, “Wonderful, just wonderful.” Or other people who knew Dusty or grew up with Dusty or met Dusty. It’s funny because those are often the people who love the show the most and that is when I know I am creating something special in the memory of her. You converted to Judaism. How Jewy are you? Did I hear you right that you keep a copy of the Zohar on the bass amp? Yes I do! and one day in rehearsal, the bass player tried to move it and I shouted, “Don’t don’t mess with the Zohar! !” We all cracked up and they just kinda leave it alone now. I converted Judaism ten years ago. I was raised with a lot of Catholic guilt and since my conversion, I am confident in saying that I only have Jewish guilt. I mean I am still half Italian and mostly Irish on the other side, so I get where Mary Isobel Catherine Bernadette O’Brien AKA Dusty Springfield was coming from a lot of the time. I love the phrase Tikkun Olam, which means “to heal the world.” That’s what Dusty did. She stood up against racism, she believed in equality and fought for civil rights. She was gay at a time when it was literally a crime in England. She was a radical lady who made choices that left this world better than when she got here. About 7 years ago, I started to listen heavily to her music, watching videos and reading anything I could get my hands on. I wrote monologues in her voice and sang her songs at an open mic night at The Gardenia Club in West Hollywood. I won a screenwriting grant at University of Southern California and used that to get some musical charts in order and prototype a show. We performed the show once at USC and Jorja Fox from CSI was there and decided she wanted to be involved. She helped bring the idea to The Lily Tomlin/Jane Wagner Cultural Arts Center, part of the Gay and Lesbian Center in LA. We had a small successful run there but I knew the final frontier was New York. We’ve overcome some incredible obstacles; it is a dream come true to be running FOREVER DUSTY at New World Stages. What was the process like of “becoming” Dusty? Years of research, research and more research. She is in my bones now and I just have to allow myself to be in the moment on stage and to be her. I have nail the British accent and sing lots and lots of songs. Big shoes to fill. I do humble myself to this story every night and hope that I tell it to the highest and best of my ability. Your writing partner Jonathan Vankin is a noted comics editor, and the show feels almost like a musical graphic novel. Do you read comics? I was a comics fan before I met Jonathan but by proximity, I have read significantly more. Tokyo Days/Bangkok Nights is one of my favorites that Jon wrote. When I was younger I read things like Warrior Nun Areala, Chester Brown, Birds of Prey, Wonder Woman. I loved getting into stuff like Harvey Pekar (who I had the great fortune of spending time with before he passed). Other favorites, How To Understand Israel in 60 days or Less, Incognegro, The Quitter, Testament, The Alcoholic, The Un-Men and Tasty Bullet, which Jon co-wrote. If our play is like a graphic novel, like you say, maybe Hollywood will come knocking for this story. Go see Forever Dusty at New World Stages 340 W. 50th St. (between 8th/9th Aves, NYC). And because we Heebs like a bargain, here’s a 40% DISCOUNT CODE = FDSOUL12 redeemable at BroadwayOffers.com, by calling 212-947-8844, or at the box office. JEFF NEWELT AKA JAHFURRY is comics editor of Heeb, SMITH and Royal Flush Magazines, reggae promoter/performer, a PR / Social Media consultant, event producer and dot connector. He is editor of THE PEKAR PROJECT, Harvey Pekar’s (American Splendor) webcomix as well as Pekar's final graphic novel CLEVELAND.